AS was only to be expected in an election year, the interim Railway Budget, presented in Parliament on Friday, has left the passenger fares and the freight rates untouched. THE damaging of M.F. Hussain’s painting of Goddess Durga at a public gallery in Surat is an attack on the very concept of tolerance. The painting has been on display for quite some time without hurting anyone’s religious sensibilities but that did not prevent activists of the Bajrang Dal from venting their fury against the artwork. IT is tough being a woman in India. First, they try to kill her even before she is born. Then they discriminate against her in matters of education and food, keeping the choicest part for her brothers. When the issue of marriage comes up, the pernicious evil of dowry is not far behind. OUR national interest apart, all this hype about a “strategic partnership” between India and the United States of America cannot but prompt further misgivings about the rationale of Mr George W. Bush’s stand on nuclear proliferation. But it is in West Asia, where the US turns a blind eye to Israel’s formidable arsenal while punishing Iraq, Libya, Iran and Syria, that the unprincipled expediency of American policy is fully exposed. WHAT’S up”, queried my husband when he found me desperately rifling through yellowing papers. “I’m trying to find my degree certificates and medals”. I responded. The last time I presented them for scrutiny was when I took the Civil Services exams, 17 years ago. THE girl who thought nothing impossible had enrolled in Delhi's Miranda House for a double course in history and law. She wanted to be an IAS officer and was confident of making it. Her uncle who had adopted her was told that the frail girl might not be able to withstand the strain of studying too much. A fierce legal battle is going on in the Delhi High Court over the “authenticity” of the National Readership Survey (NRS), which is being claimed as the true reflection of the popularity of a newspaper. A division bench of the High Court is hearing a bunch of petition challenging the NRS, including the one filed by The Hindustan Times and its rival The Times of India and of course the NRS, whose credibility is at stake. AS was only to be expected in an election year, the interim Railway Budget, presented in Parliament on Friday, has left the passenger fares and the freight rates untouched. That should please the travelling public. But the joy may not last long. The Railways has not displayed any marked efficiency to cut costs. Instead, Railway Minister Nitish Kumar has announced the introduction of 17 new non-stop express trains to link states with the national Capital. Besides, in his vote-on-account for the first four months of the next fiscal, the minister has sought Rs 20,000 crore for providing more train services to the remote and backward areas. This is partly to avoid a pro-urban slant in the interim budget and partly to woo the rural voter. The NDA government can justifiably claim credit for focussing on road and rail connectivity. But how are these ambitious projects to be financed? Some 230 rail projects worth about Rs 43,000 crore are already pending. Despite the increased budgetary support and higher market borrowings, projects costing about Rs 20,000 crore will remain unfinished even after the next five years. Announcing projects is one thing and implementing them quite another. There is need to curb railway profligacy. The opening of new divisions and the launch of new trains on political considerations also inflate the railway expenses and affect its efficiency. The introduction of “Sampark Kranti Express” trains is, no doubt, welcome, as also the incentives for frequent travellers and the proposal to ensure reservations through the Internet and cell phones. This is bound to make rail journeys more commuter-friendly. But what worries the travellers the most is the lack of safety. Train accidents are becoming all too common. Of late, there has been an alarming increase in criminal activities in trains like harassment of women and murderous assaults on passengers. These two concerns of the travelling public need to be addressed immediately. THE damaging of M.F. Hussain’s painting of Goddess Durga at a public gallery in Surat is an attack on the very concept of tolerance. The painting has been on display for quite some time without hurting anyone’s religious sensibilities but that did not prevent activists of the Bajrang Dal from venting their fury against the artwork. They come from the same lot that could not tolerate his painting of Goddess Saraswati a few years ago and kicked up a controversy over it. More worrisome than these incidents are the growing pattern of intolerance and the increasing tendency of the state to tolerate such nonsense. A few weeks ago, the Bhandarkar Oriental Research Institute at Pune was ransacked by some activists of the Sambhaji Brigade for no other reason than that one of its associates helped James W. Laine in the writing of his controversial book, Shivaji: Hindu King in Islamic India. What an irony, the little-known outfit, which was supposedly angry over the American author’s portrayal of Shivaji, had no compunction in destroying invaluable manuscripts, many of them on Shivaji himself. And for good measure, they even damaged a portrait of Shivaji and an idol of Saraswati! Far from condemning their despicable act and coming down heavily on them, the Maharashtra Government thought it necessary to ban the book, which none of the mobsters had even seen, let alone read. It was much like banning Salman Rushdie’s Satanic Verses, which few would have read in any case, just because someone demanded so. Interestingly, those who condemned the banning of Rushdie’s book were the ones who questioned Laine’s scholarly freedom. At stake in all this is the liberal nature of Indian democracy, which allows all shades of opinion to prevail and flourish. Artists and writers must have the freedom to express themselves, of course, within certain limits. Similarly, every citizen has the right to question their work, again, within certain limits. But in no case should mobs be allowed to take the law into their own hands as they did when the sets of Deepa Mehta’s film were destroyed. Every time the state turns a blind eye to such vandalism, they are emboldened to strike again and again. They are bullies and their bluff needs to be called. IT is tough being a woman in India. First, they try to kill her even before she is born. Then they discriminate against her in matters of education and food, keeping the choicest part for her brothers. When the issue of marriage comes up, the pernicious evil of dowry is not far behind. If she is widowed, she faces worse problems. One thing that remains constant is that she feels threatened. Thursday’s incident of some goons of a liquor contractor beating up a woman in public at Dhariwal is yet another affirmation of the fact that despite impressive strides made by women, their less privileged sisters continue to face indignities. Only a day earlier, a nine-year-old girl was raped by a sewadar of a temple near Khanna and a grandnephew of the Prime Minister, Mr Atal Behari Vajpayee, was killed when he was thrown off a running train for having the guts to stand up and speak for a girl who was being teased, read molested, by a group of youngsters. It is said that a society is judged by the way it treats its women and children. The unfortunate eruptions of violence against women make us all feel ashamed. Even education, it seems, does not sensitise people about the issue, as often we hear of male teachers taking liberty with their girl students. There are regular reports about young girls being sold, about "honour killings", which happened even in a city as modern as Chandigarh. At times policemen, who should be protecting the weak, are themselves perpetrators of such crimes. Even though the punishment under the law for such crimes is severe, the conviction rate is abysmally low, largely because of a huge backlog of cases and improper investigation and framing of charges. Strong societal reaction and boycott of the individuals who are guilty of such crimes would have a deterrent effect. Given the slow pace of justice, fast-track courts should also be considered for crimes against women. This is American peacekeeping. We have it from the mouth of a US Treasury horse that Saddam Hussein’s non-existent weapons of mass destruction had no bearing on the American invasion. According to this version, Mr Bush was determined to destroy Saddam from the moment he entered the White House. It was like Aesop’s fabled wolf and lamb. If Saddam didn’t make nuclear weapons, he was thinking of making them, and had to be crushed so that the Americans could seize his country with its oil wealth and make a fat killing out of so-called reconstruction contracts. Iran offers another instance of duplicity. The US had no compunctions about selling a nuclear reactor to the Shah. Objections to its use began only after the Shah’s subjects toppled him. The Iranians say they are using the reactor only to convert atomic energy to electricity. They have recently signed an agreement with the United Nations that allows the world body to carry out snap inspections of all nuclear facilities. Mr Javier Solana, the European Union’s foreign policy chief, has commended Iran for its efforts to dispel international concerns about its nuclear programme. Nevertheless, Mr Bush is pressuring the International Atomic Energy Agency (IAEA) to declare Iran in “material breach” of the Nuclear Non-Proliferation Treaty. No wonder, for Iran is the second biggest producer in the Organisation of Petroleum Exporting Countries. Libya is yet another case in point. Clearly, Mr Muammar Gaddafi read the writing on the wall after the Americans, with the British in tow, ravaged Iraq. He did not want to suffer the same fate. And so he agreed last month to abandon all efforts to obtain nuclear, chemical or biological weapons and to sign a protocol to the NPT that permits more intrusive snap inspections. “Libya has shown a good deal of cooperation, a good deal of openness,” says Mr Mohammed El Baradei, the IAEA chief. But this is not enough for the US, which continues to treat Libya as a pariah state. Libya is, of course, the world’s eighth largest oil exporting country. Israel’s nuclear programme has been an open secret ever since the late forties when the search for uranium in the Negev desert began. The IAEA, American Central Intelligence Agency and the Stockholm International Peace Research Institute have all discussed its weapons of mass destruction. They were not taken in by the false control room panels and bricked over lifts and hallways at Dimona, which the Israelis called a textile plant, agricultural facility and meteorological station. Details burst into print in 1986 when Mordechai Vanunu, a worker at the Dimona reactor, told a British newspaper that Israel had an arsenal of between 100 and 200 nuclear devices. According to him, Dimona produced 40 kg of weapons grade plutonium annually. The Mossad dealt typically with Vanunu. A traditional honeypot trap induced him to leave London for Rome where he was kidnapped, bundled off to Israel, tried in camera for treason and sentenced to 18 years imprisonment. All being well, he should be released this year. The US chose to swallow that indigestible fiction. Wallworth Barbour, US Ambassador to Israel from 1961 to 1973, reportedly suppressed all news of the bomb with the plea that “the President did not send me here to give him problems. He does not want to be told any bad news.” The reports that the US Congress commissions periodically on “the acquisition by foreign countries during the preceding six months of dual-use technology useful for the development or production of weapons of mass destruction” never mention Israel. They concentrate on North Korea, Iraq, Iran, Libya, India and Pakistan. (India and Pakistan will no doubt be omitted now.) Nor did Israel figure when the US National Air and Space Intelligence Centre named 18 countries as being capable of presenting a ballistic and cruise missile threat. The list included Bulgaria, Egypt, Pakistan, Turkmenistan and Yemen. Stephen Ledogar, the US delegate at the Geneva talks on the Comprehensive Test Ban Treaty, promptly shot down a Pakistani suggestion that Israel also be brought within its purview. So, Israel is excluded when Mr Bush announces that “leaders who abandon the pursuit of chemical, biological and nuclear weapons, and the means to deliver them, will find an open path to better relations with the US and other free nations.” Of course, the question of “better” relations does not arise when relations are the best and closest in the world. It is not quite the same with India which must constantly trim its economic and political agendas to continue to merit American favours. Israel has shown repeatedly that even its conventional forces can defeat any conceivable combination of Arab armies. In any case, it has nothing to fear with Iraq destroyed, Lebanon squashed, Egypt and Jordan in America’s pocket, Libya neutralised and solitary Syria still trying to decipher the message of a lightening Israeli raid and mounting US pressure. But if the nuclear arsenal is not needed militarily against dispossessed Palestinians armed only with crude homemade bombs, it still serves a formidable diplomatic purpose. The ball is in Mr Bush’s camp. If he wants the US to be taken seriously as the international peacekeeper and not just as the global bully, he will be even-handed in West Asia. It would spare the region another conflagration. It might also help to improve his administration’s credibility. WHAT’S up”, queried my husband when he found me desperately rifling through yellowing papers. “I’m trying to find my degree certificates and medals”. I responded. The last time I presented them for scrutiny was when I took the Civil Services exams, 17 years ago. Now, my qualifications and competence were again on test. Only this time, it wasn’t the mandarins at the UPSC, doing the assessment: it was my 10-year-old son! It all started rather innocently. My son was doing a routine homework assignment when I corrected the spelling of accessaries to accessories and rhynoceros to rhinoceros and pointed out that ships were not parked in a harbour, but anchored in it. The little man took umbrage, and argued, “Look, my teacher’s marked it correct in my written work”. The complete conviction in his teacher being correct and complete lack of confidence in his mother’s erudition, or rather the lack of it, was a fell blow for my self-esteem. Every time I checked an error in spelling or fact I found myself having to substantiate it with encyclopaedia and dictionaries. I would spend evenings helping him prepare a chart with diagrams et al but, when it did not meet with his teachers’ approval, my proficiency rating plummeted. That was what had me rummaging for my degrees. Junior needed to know that his mom had gone to school too and obtained a first class first Masters degree. The student-teacher relationship, the guru-shishya parampara, is special and has been down the ages. It has to do with the aura every child invests his teacher with. The teacher is the “significant other”, the “Guru, tutor, instructor and coach”, in every little-one’s school world. The one who knows it all, is the final arbiter of all that is right and wrong, and above all holds the key to the mysteries of the world. In school, of course, the teacher is God but even outside when we run into Brother, Ma’am or Sir, the traffic stops, and a hush descends on my noisy brat as he points them out with awed admiration. From that position the teacher’s words carry complete conviction, magical appeal and unrivalled powers of persuasion. The epics tell us of Eklavya, who cut off his thumb as “dakshina” for his Guru Dronacharya even though it meant an end to his career as an archer. The same spirit, miraculously, imbues most younger students even in the present day. When I voiced my concern about TV, I was labelled a spoilsport; the teacher organised a debate and my son was suddenly an articulate spokesman for the harmful effects of TV. Books lay gathering dust, until Ma’am directed that each boy read a book a week and write a report. Suddenly, my son was reading abridged versions of the classics and was an authority on Charles Dickens and Mark Twain. Every parent learns to cognise and appreciate that the teachers can get their little devils to write poetry, and prose, inspire frenzied research on esoteric topics, teach them to paint, and even sing in tune. They inspire them with the motto of ‘Citius, Altius, Fortius’ in sports, and infuse them with charity and capitalism when the proceeds of the School fete are used to fund scholarships for poor kids. The teacher is the miracle worker. Mom and Dad, are well, just progenitors, to be kept in good humour so they keep the pizzas and pocket money coming in. There’s a lot of time and energy invested in teachers’ day and birthday: thoughtful cards are hand-painted and fresh flowers hand picked. Parents’ birthdays need a strident reminder and if you try and compare, there’s the gentlest rebuff, “...hey Mom I love you. Surely you don’t need a card or a bunch of old flowers to tell you that...” Well, who can argue with that except the green-eyed monster inside who feels she could use that brand of “special thoughtfulness” inspired in her progeny by his teachers. I guess if you can’t beat them join them: so I have volunteered with my son’s school, as a substitute teacher. Perhaps I will now discover, that special ingredient, that will take me from Mom to Ma’am and absolution. THE girl who thought nothing impossible had enrolled in Delhi's Miranda House for a double course in history and law. She wanted to be an IAS officer and was confident of making it. Her uncle who had adopted her was told that the frail girl might not be able to withstand the strain of studying too much. So she was asked to come back to Patiala and enrolled for "Sab ton saukhi MA and that was in Punjabi…It was a turning point in my life" says the writer who has lived with the consciousness of two things, God and death. Born in a conservative, feudal family of Rabbon village, Ludhiana, in 1935, Dalip Kaur grew up in an over-protective environment. But she never allowed it to become her limitation. For it's this limited world that was to later become the oasis of her life and work. Within its claustrophobic walls, she dared to dream, think differently, and even breathe free. Slim, tall and extremely dignified, she has been a guide, friend and philosopher to generations of students, many of whom have become teachers themselves. With her tinkling little-girl laughter and a heart-warming exuberance laced with an earthy simplicity, she demystifies her creative process, saying, "Main kadi vi apni writing nu sir te nahin chakeya." All those who know her are aware that for her writing is as vital as breathing and eating. A winner of Padma Shri, this well-read academician always takes a stand in an assertive, non-aggressive manner. She carries neither the baggage of her scholarship nor flaunts the mantle of her writerly self. Her deep engagement with life can be judged from the fact that she thinks nothing of travelling all the way to Doraha to be with an uncle who has to be operated, doesn't snub the attendant who asks her if she knows Punjabi and packs lemon squash and pickle she has made herself for a journalist who has come to interview her. She rues the fact that contemplation has vanished from our information-oriented world and that education is now merely restricted to dissemination of facts. There is neither knowledge nor wisdom, as we become more and more fragmented trying to escape from ourselves. "Asi apne aap de kol nahin baithde…shabdan tak hi reh jane haan shabdan de paar nahin jaa sakde…" It is this desire to know herself and move beyond mere words that has governed her own life and work. Though her work mainly illumines the less luminous world of a woman's psyche, she doesn't think of herself only as a woman writer. She feels that a writer brings her realm of experience to the work, and larger issues are universal, concern humanity, transcending gender boundaries. No creation can be bigger than the writer. "Jidan da insaan hunda hai odaan diyan hi odhian rachnan hundian ne." (The writings are as good as the writer) So even though a lot of books are being written, but only that which survives the test of time endures. "Jeeon jogan hi rahega." According to her, a lack of an objective and rooted tradition of literary criticism in Punjabi is a major flaw because criticism is personalised and not evaluative, she feels. "We flaunt all the isms we have imported from the West, structuralism, colonialism, feminism… merely to show off without relating them to our life or literature or milieu." As far as awards are concerned, she in her characteristic manner says: "Maan samman ek bande da hi hunda hai, eda koi vadha arth nahin hunda. Jism da hi naam hunda hai, rooh da nahin." For her, a writer is only a medium, not a source and writing, a way of connecting with the collective unconscious. About the future of Punjabi, Dalip feels that our literature and culture would survive by the sheer presence of the Guru Granth Sahib. But we should make a conscious effort to get our scriptures translated into the world languages. That shall facilitate the spread of our language and culture. We lack genuine pride in our own culture and language. Let us not forget that it was in this region that scriptures were written, great literature was created. We must reconnect with our rich and glorious heritage. Dalip feels that the core strength of our culture is spiritual. We have always believed that this body is only an instrument to fulfil karma and dharma. But now we are aping the West and focussing too much upon the physical, material reality. In this era of specialisation we focus on being good professionals and excelling in our careers, but what about becoming good human beings which is of course, more important. The self-centred and narcissistic attitude is bound to have a ripple-down effect on our social fabric, she feels. Her first collection of short stories, "Prabal Wehin" in 1956 was published while she was still in college. In 1969 came "Agni Pariksha," her first novel. "Eho Hamara Jiwana" won her the prestigious Sahitya Akademi Award in 1972. 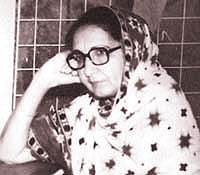 "Hastakhar", "Pair Chaal" and "Jimin Puchche Asmaan" constitute her famous trilogy. She has written 28 novels, seven collection of short stories, the first part of her autobiography, "Nange Pairan Da Safar" and her literary biography, "Puchchte Ho To Suno." She received the K.K Birla Foundation's Saraswati Samman for 2001 for "Katha Kaho Urvashi" which was written after a hibernation of five years from 1994 to 1999. The death of her brother in 1994 was a traumatic experience that made her delve deeper into religion, philosophy and the scriptures for solace. Yes, she agrees that the printed word is under a multiple assault but suggests all that is best in our fiction, poetry and prose should be filmed so as to arrest the attention of the generation that does not read but prefers to see. Not many know that this unassuming writer loves gardening and feeding birds. She even talks to her plants and dreams about them and they respond to her gentleness. Be it a rose bush that refused to bear flowers or a stubborn mango tree that did not bear fruit. Watching art movies, especially those of the late Smita Patil, is another of her pastime. She takes genuine pride that Bhupinder Minhas, her supportive husband, has published "Ilyas Diwana," a collection of verse about both East and West Punjab. However, her son likes to write poetry in English. When asked to name her best story, she simply quipped, "It's yet to be written." That's Dalip for you, forever effervescent, forever smiling, forever looking ahead. She is more like a river, serenely flowing. The bench, however, has stayed a single judge’s earlier order allowing the publication of the NRS report. Similar litigation is going on in the High Courts of Rajasthan and Calcutta, where some leading local dailies are also locked in intense legal battles over the NRS issue. Jaipur-based Mapsor Advertising Agency, is one among the leading litigants challenging the credibilty of the NRS as it has described the survey as far removed from truth about the actual readerhip of newspapers than the Audit Bureau of Publication (ABP) figures on their circulation. The war between rival publications had extended even outside the court room as the Times of India and The Hindustan Times and some leading language papers have come out with articles claiming a higher readership than the rival. Arguments are being given that the actual circulation is not the only parameter of the real popularty of a newspaper because it is read by several people. Some litigants have moved the Supreme Court againt the High Court division bench’s stay on the NRS, but the apex court has deferred the hearing till the High Court disposes of the case. An interesting public interest petition has come up before the Supreme Court raising the question of MPs and MLAs showing least interest in debates on important issues in Parliament and state assemblies as most of the time they prefer to “stay away” from discussions. An NGO, Janhit Manch, had sought a direction to the presiding officers of both Houses of Parliament, the Prime Minister and the Leader of the Opposition to ensure proper attendance in the House. But a three-judge Bench, headed by the Chief Justice, Mr V.N. Khare, dismissed the petition, saying Parliament is an independent body and no writ direction could be issued under the law to it about conducting its proceedings. The best course for the NGO would be to highlight the issue during the coming Lok Sabha elections to make people aware of it so that the right people are elected, the court observed. The victims of the Bhopal gas tragedy waiting for disbursement of Rs 1,360 crore compensation deposited by the US company Union Carbide with the Reserve Bank of India have alleged in their petition before the Supreme Court that a major part of the money has vanished from the “victims’ corpus”. Thirtysix victims, led by Abdul Samad Khan, in their application have claimed that as on March 31, 2002 a balance of Rs 1,360 crore should have been in the corpus account with the RBI, but the Victims Welfare Commission report states that only Rs 475.76 crore is shown as balance in it. Taking a serious view of the matter, the apex court has directed the RBI to submit an affidavit by February 11 giving details about the actual position. Whatever be the religion, language, custom, caste or dress of individuals, since they are all human beings, there can be no objection to their interdining or intermarrying. A thousand-year long Buddhistic heritage could not be done away with. The good points in it, which are not contradictory to the Vedic doctrines, must be fused with the Vedic heritage, purifying and modifying both to suit the times. The fire of anger is fatal. Today varnashramadharma and Hinduism are misrepresented and denied by its votaries. The remedy is not destruction, but correction. Let us reproduce in ourselves the true Hindu spirit, and then ask whether it satisfies the soul or not. Many think of God only after receiving blows from the world. But blessed indeed is he who can offer his mind, like a fresh flower, at the feet of the Lord from his very childhood. One should practise renunciation in youth.